Love mysteries? Love short stories? Put them both together and you’ve got a wonderful 5-star debut! 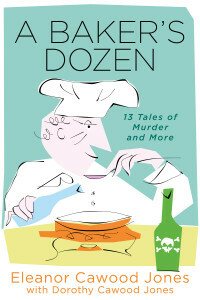 A Baker’s Dozen: 13 Tales of Murder and More is a diverse compilation of short stories spanning 30 years, crafted by a former journalist and including two contributions by her mother, a court reporter and professional editor. From murder in the mountains of Tennessee to the adventures of an all-woman air conditioning repair crew in Northern Virginia, a trip down the runway of a senior citizen beauty pageant, and the secrets revealed in the aftermath of a violent tornado, this page-turner is a blend of psychological suspense, surprise endings, satire, tearjerkers, and just plain, laugh-out-loud fun. Stories include: “Dog’s Best Friend,” where a farmer’s wife has to make the ultimate decision between life and death; “Mrs. Gallagher,” featuring a determined 85-year-old who is most definitely not what she seems; “The Sampler,” the co-author’s award-winning short story about a happy retired couple with a really big secret; and “Burying Toby,” a touching yet humorous story of two teenagers who help their beloved younger sister stage a funeral for a favorite pet. Other don’t-miss tales include an affectionate and rollicking satire of Nancy Drew, the story of a young boy’s convenience store run that morphs into a fantastical adventure, a tongue-in-cheek piece on soap operas and game shows, and a first-person account by an intelligent house cat who witnesses a brutal murder and lives to tell the tale. Readers of authors as diverse as Alfred Hitchcock, Ellery Queen, and Maeve Binchy will enjoy these stories. Each one is unique and an unexpected twist or surprise ending is guaranteed in each tale.